The Tiny Solar Energy Module (TSEM) by [Jasper Sikken] is not only physically tiny at one-inch square, but it is all about gathering tiny amounts of solar energy — amounts too small to be useful in a conventional sense — and getting meaningful work done, like charging a battery for later use. Elements that make this board easy to integrate into other projects include castellated vias, 1.8 V and 3.3 V regulated outputs that are active when the connected battery has a useful charge, and a low battery warning that informs the user of impending shutdown when the battery runs low. 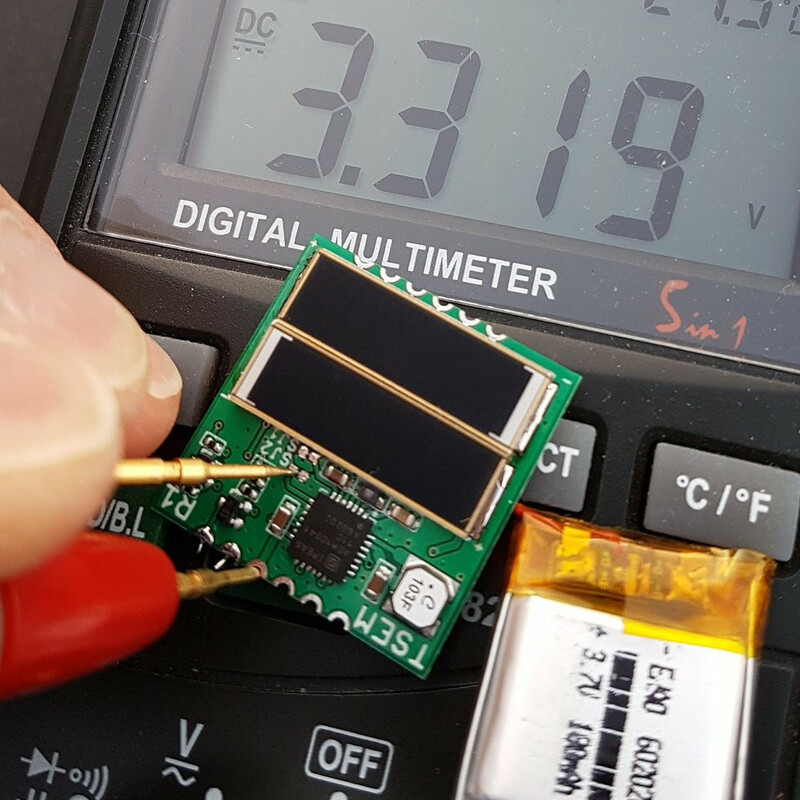 The two surface-mount solar cells included on the tiny board are capable of harvesting even indoor light, but the board also has connection points for using larger external solar cells if needed. The board shows excellent workmanship and thoughtful features; it was one of the twenty Power Harvesting Challenge finalists chosen to head to the final round of The Hackaday Prize. The Hackaday Prize is still underway, with the Human-Computer Interface Challenge running until August 27th. That will be followed by the Musical Instrument Challenge before the finals spin up. If you haven’t started yet, there’s still time to make your mark. All you need is a documented idea, so start your entry today. I wonder if it gets sold anywhere at some point? Hackaday.io is like the new instructables, terrible for trying to get anything meaningful from it. Secondly, this is basically just a breakout board for that IC, which isn’t available in the US or through normal distributors from a quick google. If you look at the datasheet they basically have the schematic from this project. While I do agree that Hackaday is the new Instructables (due largely to the hackaday prize, which asks people to write projects just because of the money, not with real sharing objectives), I do not see any bad in copying a reference design from a datasheet; after all, reference designs are there to exactly that: being a functional reference of usage to a given IC. Fair enough, I shouldn’t have knocked the project. I just saw the .io page and had a flashback to instructables back in the day, and took it out on the project in my comment. on doing tested circuits from datasheet, I’m on same page with you – gulag by HaD court martial! A ‘serious’ reason can be a way to assign blame (In the nicest way). If you stick to the reference design and issues crop up in batch X and no erratas had been missed on the datasheet, it’s a better case for assistance with the manufacturer (they’ll also have their own ref. boards on the shelf, rather than waiting for you to ship a sample) than something which they could drag on picking holes in your design. Wonder if the performance would be bigger if more of the spectrum was used? does it work on candle light ???????????? Pretty cool. I would have put a third cell over top over the energy manager IC and the low profile components to get some more power. You could stand up some zero ohm resistors to attach the cell to, and squirt some epoxy under the cell. You could also just put the components on the opposite side of the board, and put 3 cells on the front. There is no reason this board needs to sit flat on some other board, and you could still use the castellated connections. Designers working on low power designs should really consider if it’s worth harvesting power or not. If size allows for it, it might be much cheaper to build in AA-alkaline cells or other battery technology and having these replaced every few years. A Fujitsu LR6G07 1.5V AA-cell, costing only €0.30/pce has a capacity of 2.8Ah. That’s about 4000Wh of energy. According to this project’s description, 550µAh is harvested in a 4.12V Li-ION evtery day. That’s about 2Wh/day. For that, you need two solar cells, each costing €1 and an unavailable, single source charging IC. Suppose the IC costs the same as the Linear LTC3105, that’s €5/pce. So after about 2000 days, more than 5 years, of indoor charging with a TSEM, you’d get the same energy of a single AA-cell. Yes, these calculations are oversimplified: disregarding voltage drop of the AA-cell, self-discharge, …. An AA-cell would also need a boost converter (e.g. MCP1640, €0.50/pce). Correction: AA-cell is 4Wh, not 4000Wh. TSEM charging is 2mWh/day, not 2Wh/day. Temperature range/fluctuations, battery leakage, cost of battery holders, cost/difficulty of replacing a battery (remote sensor) are other considerations. A Fujitsu LR6G07 1.5V AA-cell, costing only €0.30/pce has a capacity of 2.8Ah. That’s about 4Wh of energy.